EastEnders actress June Brown is launching The Children's Society's annual Christingle campaign this year, to help raise £1.2m for vulnerable children and young people. In the UK there are almost four million children and young people dealing with hardship, abuse and neglect which are ruining childhoods and future prospects. 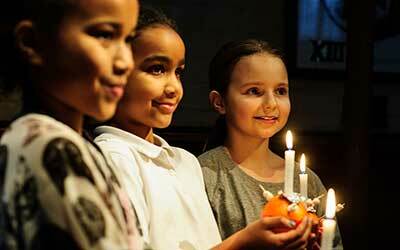 June’s support will encourage people to attend one of the family-friendly Christingle fundraising events in schools and churches in their local area. “That’s why I’m supporting The Children’s Society’s Christingle celebrations, as money raised will go to support children and young people in this country who are suffering from terrible hardship, abuse and neglect. It’s why Christingle is so important, as it reminds us of the hope we can bring to thousands of children and young people in desperate need, especially at a time of year that often highlights their loneliness, and lack of loved ones to support and protect them. Matthew Reed, Chief Executive of The Children’s Society, said: “We are delighted that June, with her profile and genuine compassion for our causes, is supporting our Christingle campaign this year and helping to spread awareness of the work we do to support disadvantaged children.